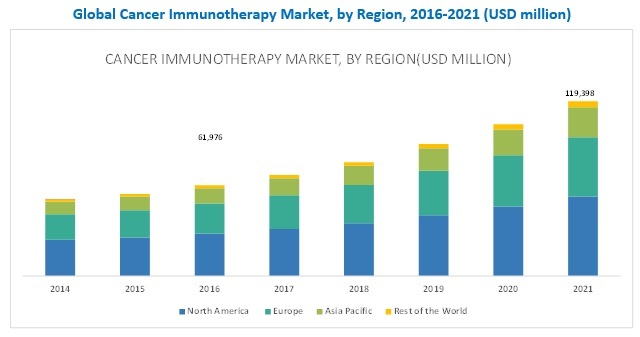 [140 Pages Report] The global cancer immunotherapy market is expected to reach USD 119.39 Billion by 2021 from USD 61.97 Billion in 2016, at a CAGR of 14.0% from 2016 to 2021. The major players in the cancer immunotherapy market are Amgen (U.S.), AstraZeneca (U.K.), F. Hoffman La-Roche (Switzerland), Bayer AG (Germany), Bristol-Myers Squibb (U.S.), Eli Lilly and Company (U.S.), Janssen Global Services, LLC (Belgium), Merck (U.S.), Novartis (Switzerland), and Pfizer (U.S.). This report aims to provide insights into the global cancer immunotherapy market. It provides valuable information on type, application, end user. Details on regional markets for these segments have also been presented in this report. In addition, leading players in the market are profiled to understand the strategies undertaken by them to be competitive in this market. 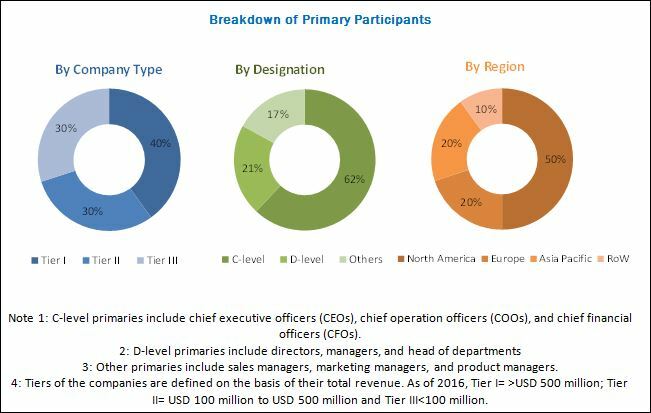 The global cancer immunotherpay market is projected to reach USD 119.40 billion by 2021 from USD 61.98 billion in 2016, at a CAGR of 14.0%. This growth can be attributed to factors such as increasing adoption of target therapy over traditional therapy, emergence of biosimilars, increasing demand for mAbs, high prevalence of cancer. Cancer immunotherapy drugs are designed to alter or boost the body’s natural immune response to fight cancer this market is research-driven with a high degree of dependence on the discovery of molecules that can generate an immune response against various indications. The cancer immunotherapy market has been segmented, on the basis of product into monoclonal antibodies, immunomodulators, vaccines, and check point inhibitors. The check point inhibitors segment is estimated to witness the highest CAGR during 2016-2021. The high growth can be attributed to the benefits offered by this therapeutic drug. By application, the global cancer immunotherapy market is broadly segmented into lung cancer, breast cancer, colorectal cancer, prostate cancer, multiple myeloma, melanoma, head & neck cancer, and other types of cancer. In 2017, the lung cancer was estimated to account for largest share of global cancer immunotherapy market. Due to the increasing number of patients suffering from lung diseases, the lung cancer segment was expected to hold the largest share in the next five years as well. Geographically, the North American market accounted for the largest share of the global cancer immunotherapy market in 2016. The large share can be attributed to factors such as rising number of patients suffering from cancer, increasing adoption rate of immunotherapy, and development of bioinformatics tools are enhancing the drug development process. The treatment options for cancer, such as chemotherapies and radiation therapy, although have more side effects, are more widely used as compared to immunotherapies. The former are all based on destroying cancer cells by irradiation, chemotherapy, or surgery. While they can effectively kill or remove cancer cells, the use of these treatments is often limited because they tend to destroy healthy cells in large numbers as well. As immunotherapies involve the mechanism of enhancing the body’s own immunity using man-made proteins such as monoclonal antibodies, they are accepted worldwide over other treatment options. What are the upcoming applications for cancer immunotherapy? While immunotherapy has shown significant promise in the area of cancer treatment, its high cost has served to limit overall patient access. This poses a significant financial burden on low- and middle-income cancer patients. This is restricting the cancer immunotherapy market from growing at its full potential. Some of the key players in this market are Amgen Inc. (U.S.) F. Hoffmann-La Roche Ltd (Switzerland) Bristol-Myers Squibb Company (U.S.) Merck & Co., Inc. (U.S.), Seattle Genetics Inc. (U.S.), Celgene Corporation (U.S.), Eli Lilly and Company (U.S.).